Off-Grid PV System Up & Running | What's NEW at EcogenBuild? We “flipped the switch” to activate our new Off-Grid PV system almost two weeks ago and have been enjoying the benefits of energy independence ever since. Two weeks ago we commissioned our Off-Grid PV system and have since had peace of mind knowing that if there is a grid failure, we’ll be just fine. To be clear: we are not operating the entire house from this system. However, we are running our house’s critical life support systems plus we’re also finding ways to use it to further reduce our grid energy consumption with some additional loads that aren’t hard-wired to the Off-Grid system. Concept. The purpose of the Off-Grid system was to provide uninterrupted, clean energy to our “core” systems. With a highly efficient Passive House, we can go indefinitely without heating and hot water even in the winter, provided there is power to some basic, critical systems. So, back-up power makes the house entirely viable for continuous habitation for even long-term power outages. Given that this house was designed to collect and store all the thermal energies it would need, and to generate all its own electrical energy, it would be a shame to be have such an efficient house with all the required heat energy stored away but unusable if the grid went down. 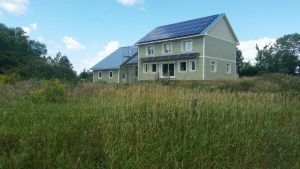 Relying on a fossil fuel generator to back up the house was naturally out of the question for a “zero carbon” lifestyle, and converting some of the house’s PV capacity to Off-Grid just made sense in the context of this project, especially when a constrained grid only allowed us to connect a 7 kW grid-tied system. In a simple way, our Off-Grid system is like having a back-up generator that not only runs on free, zero-emission “fuel”, but more importantly, is continuously providing power to us and offsetting our energy consumption. So, like a back-up generator, it is there to reduce the risk to our comfort and viability when the grid goes down, but unlike a generator, it is always working to reduce our grid power consumption, helping to pay for itself. Components. The system is made up of twenty 260W PV modules, a 100 amp charge controller, sixteen batteries that make 48 volts and 860 amp-hours storage, and a 4.4 kW inverter. It includes a web-based monitoring capability that can be viewed at this link: http://data.magnumenergy.com/MW1391/. 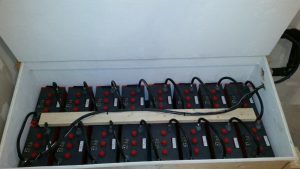 The batteries and inverter give us over two days of stored energy for the loads that are hard-wired to it via a separate Off-Grid distribution panel. Systems supplied with Off-Grid power include: well pump, ERV (Enthalpy Recovery Ventilation), hydronic control and pumping including heating, cooling and solar thermal systems, fridge and kitchen lighting, smoke detectors, communications outlets (radio, internet and phone charging), and mechanical room lighting and outlets. Inverter, charge controller, battery box and ventilation pipes. 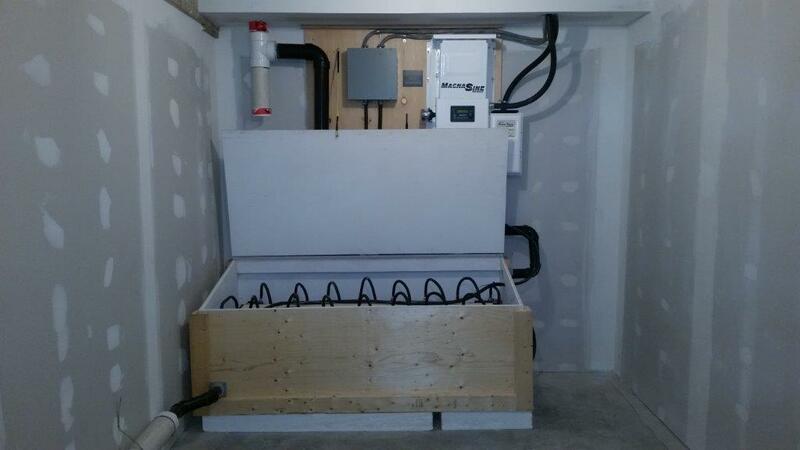 Image: Inverter, charge controller, battery box and ventilation pipes. 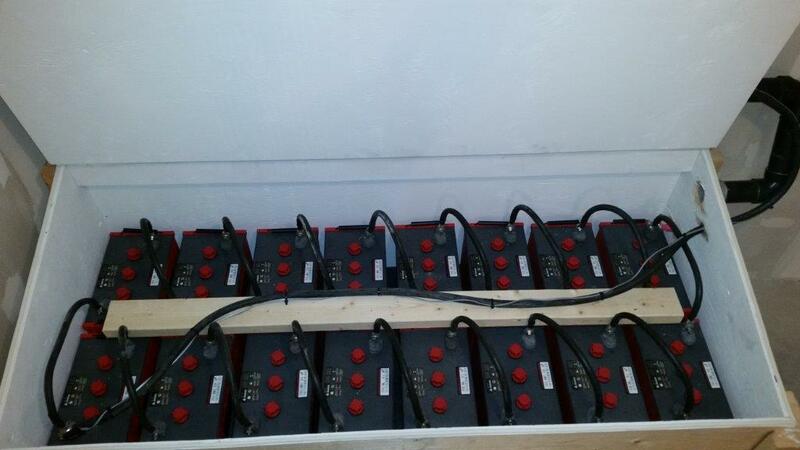 Battery box with 16 deep cycle batteries. The Off-Grid system is backed up by the grid itself, but back-up with other kinds of generation are completely possible. There is an ability to turn the entire system off and bypass it with grid power for maintenance purposes, but the grid connection is primarily for topping up the batteries on days with low solar production in the winter, or when it is very cloudy or rainy. Making it Work for Us. The PV modules that are allocated to the Off-Grid system are generously sized for the amount of energy needed to replace the power consumed over a 24 hour period. With the lower price of PV in recent years and the high cost of battery storage, a bias toward more PV modules is becoming increasingly common. In the summer with its longer days, the amount of energy the modules produce for this system is well over twice what the loads use. Winter production will be closer to the amount consumed, but still in excess. That is an important strategy because there are more days of less generation due to clouds, snow cover and fewer sunlight hours. The summer abundance does, however, provide an opportunity to further reduce grid consumption if preparations are made for it. For instance, additional circuits can be included in a house to put Off-Grid outlets in various locations where appliances could make discretionary use of the surplus. In our case, one thing we’ve done is set up a large capacity dehumidifier on a timer so that it runs during the summer days while the system is generating. Daytime use of the excess reduces the impact on the batteries, thereby extending their lifetime. Other loads that could be run judiciously while the system is generating include: toasters, kettles, wash machines, televisions, and radios. Even freezers, stoves, dryers or car chargers would be possible if you have the option wired into the house and a large enough inverter. There are functionalities built into many of the newer inverters that expand on these concepts and allow additional PV modules with AC inversion (think grid-tied modules) to be hooked into the inverter. This increases power production capacity, but one typically needs to make allowances for power diversion because the inverter cannot turn the flow of power off from these extra PV modules. Such functionality makes for a more versatile system for fully Off-Grid homes and provides more power for systems that can run during sunny periods. “Baking it in” with Design. 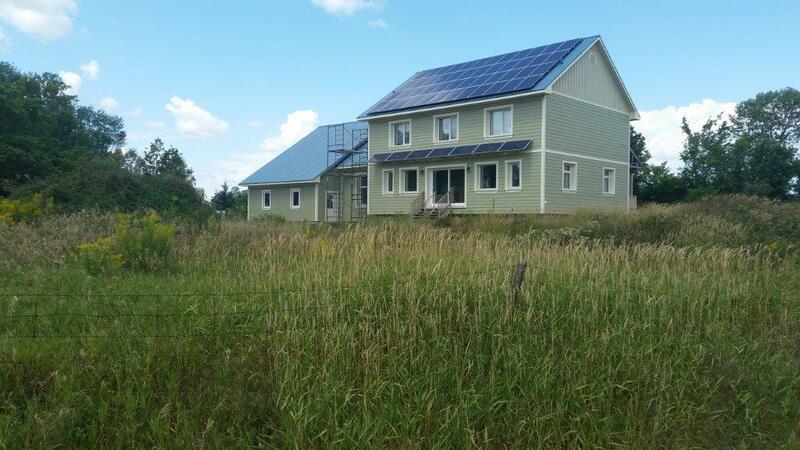 If you know the capabilities of Off-Grid systems and the associated lifestyle, you can influence the design of the house to support the functionality of these new inverters to make Off-Grid living more comfortable and affordable. It is during the design stage that you need to conceive and build-in the energy concepts that will make an already efficient house even more efficient, cost-effective and environmentally-friendly where power generation is concerned. This is possible when you understand and are proficient with all the elements of the equation: energy generation, storage, loads (appliances, lifestyle, seasonal demands), building heating, ventilation and cooling, power distribution, and system management. We can help with this: designing ultra-low energy houses that match your intended lifestyle, and clean energy generation and storage systems that work synergistically with effective heating and cooling systems. This can give you all the unparalleled comfort of a Passive House without having to micromanage so many systems. In the meantime, we continue to live and learn how to get the most from our Off-Grid system. We look forward to our next Open House on 11 September when we can to show it to our visitors. Doors will be open with five one hour tours starting on the hour from 10AM through 2PM. Hopefully you can make it! Next Blog. In the next post, we’ll focus on the grid-tied system that was activated this past Thursday and is now operating under the Net Metering program. Lots of learning there which we think will interest many people given that the microFIT program appears to be on the way out. The Net Metering program may well be the right way ahead for most homeowners wanting to generate their own energy.